Learning how to make great crepes is an impressive cooking skill to have. Crepes are an excellent thing to know how to make well because they are so versatile — you can use them to make both sweet and savory dishes. You can create savory crepes for any meal. Our ham, egg, and cheese crepes recipe is perfect for breakfast, lunch or dinner. Crepes may seem a little fancy, but they’re simple to make. Everyone around your table will love this dish. Once you serve it once, be ready to make it again! But you won’t mind — your family will be getting a delicious, filling meal. If you’d like to try making homemade ham and cheese crepes, see our recipe below! Combine the 2 eggs, milk, flour, and butter in a bowl. Beat on high until the batter is smooth. If you chose to use the fresh herbs, add them and stir the mixture until they are well combined. Lightly grease a 10-inch skillet over medium heat with butter. Wipe out any excess butter if there is any. Pour 1/4 cup of the batter into the pan and swirl it the entire surface is covered with the mixture, which should form a thin layer. Then, allow the crepe to cook until the top begins to look done. Take a flat spatula, gently lift one edge, and turn it over the rest of the way with your fingers. Let that side cook the whole way. Put the cooked crepe on a plate and set it aside. Repeat with the remaining batter. You should have at least eight crepes when you’re finished. Melt a little bit of the butter in your 10-inch skillet over medium heat. Cook your remaining eight eggs sunny-side up until the whites are set — the yolks should still be a little bit runny. Season the eggs with salt and pepper, then set them aside. Melt a little more butter in the skillet and add a crepe. Spread the crepe with cheese, add a slice of ham, and top it with an egg. 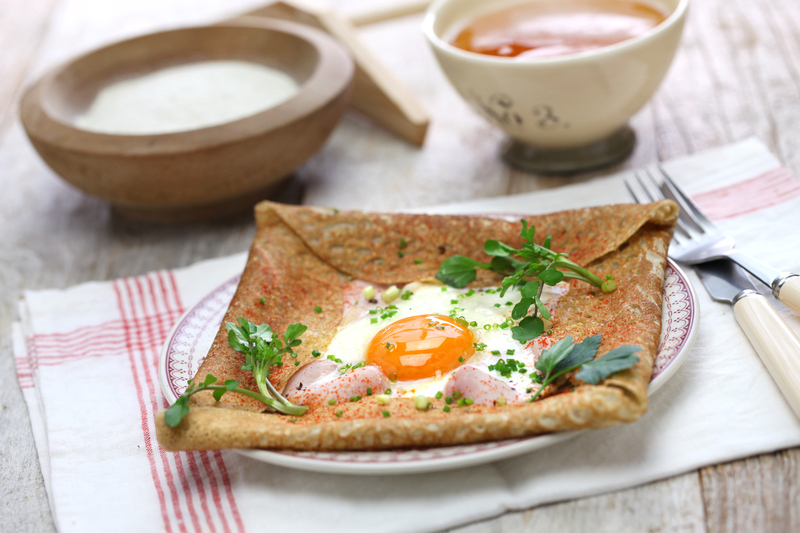 Fold the edges of the crepe into the middle but leave the yolk visible. Cook the crepe until it is crispy on the bottom. When the crepes are finished, transfer them to plates and add the green onion if desired. If you want to take this ham and cheese crepes recipe to the next level, be sure to use Sauder Eggs. To find our top-quality eggs at the nearest store to you, use our store locator today.